Ed and I have been snow shovelers for years. Every time it snowed, we would pull on our snowpants and boots, grab the shovels, and head out with the girls to shovel our driveway. We already had a significant snowfall earlier in November, although it didn’t last long and melted away fast. Last year, we wanted to buy a snowblower, but never actually got to the store to buy one. This past summer, Ed turned 50 and decided that yes, we needed to actually buy a snowblower this winter. So we bought one during a Black Friday sale. Our first snowblower ever! Emmy helping us shovel the driveway after our heavy November snow with her little red shovel. We had such a mild December, however, that Ed and I have joked around, saying it’s our fault that the weather had been so mild. When you have a brand new snowblower and want to try it out, of course there will be 60 degree weather in December! Well, our day came and we had one and a half inches of sleet fall last week. Ed did use the snowblower, but the weather was atrocious and it was raining as he snowblowed the sleet off of the driveway. At least he didn’t have to shovel that heavy sleet off of the driveway. Last year in January, I was already heartily sick of cold weather. We had subzero temperatures and it was so cold that four days of school were cancelled. This year, we are hovering around 30 degrees every day, and I’m hoping it stays that way. Our winter has been mild so far, and I think we deserve it. Even if it means we won’t need our new snowblower! There’s one thing we know we can count on; if we don’t use our snowblower very much this year, we will have plenty of use for it in the coming winters! This week’s writing prompt continues to be NEW. Did you start a new tradition? Did you get something new over the holidays? Do you have a new resolution/goal/word for 2016? Maybe you need something new in the New Year! Write your Spin about something NEW to end this year and start the next! 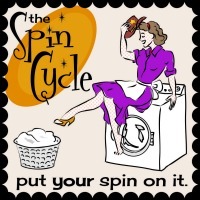 The Spin Cycle linky will be open until Sunday, January 10th! We visited a house recently that is all lit up for Christmas. There is a light show, and the lights are coordinated with music. It is loud and obnoxious. And very, very cool! Lots of people are driving by to take a look, and even more people are parking their cars to come up to the house to watch the light show. Right now, this neighborhood is not very peaceful. This house is on my old stomping grounds, right on the way to my high school. Of course, when I was in high school, this house didn’t exist. Many older homes have been torn down and “McMansions” have been built in their place. I can’t even imagine the amount of money it took to create such a display. However, this house is so popular for more than the lights. The owners are raising money for the Wounded Warrior Project, and their goal is to raise $10,000. Perhaps they are bringing some peace to the world after all! This house is at the corner of Belle Plaine and Engle. We gave a small donation for Wounded Warrior Project, and if you are in the neighborhood, it’s worth a visit! Did you write a blog post about peace? Link it up here! Join us for the month of December with these #SpinCycle writing prompts. Be sure to add the Spin Cycle button to your blog post to tell others about the Spin Cycle! When Will Chicago Find Peace? The story of a nine year old boy being lured into an alley to be shot to death shattered my heart. The fact that it was gang related makes no difference to me; nine year old boys should not be afraid of being shot in an alley. This is a fear my children will never know. There are rarely any shootings in our Chicago suburb. My children won’t be lured into an alley; their father (or mother) are not gang bangers. I am not afraid of stray bullets flying through my living room. How can I help prevent these violent crimes? I could vote for stricter gun laws, which I am inclined to do, but many of the guns in these crimes are obtained illegally. I could vote for politicians who will be tough on crime, but I’m only allowed to vote for Cook County politicians, not City of Chicago politicians. What, then, can I do to help bring peace to our city? The shootings in Chicago are out of control, but violence doesn’t require a gun. Nor does violence only happen in urban areas. When I was teaching in a small rural town, a young teacher didn’t show up for work one day. She hadn’t called for a substitute and didn’t answer the phone. The principal drove out to her farmhouse and discovered something simply horrifyingly. My colleague had been strangled with a telephone cord, presumably by someone she knew. I just don’t know the answers. I wish I did. What can I do? Well, I can continue to do what I’m doing. I can give my students a hug or high-5 when they walk into the classroom. I can help them feel safe when they are at school. I can teach my preschoolers to be kind to each other; to share; to not hit; and when something happens, to say, “I’m sorry.” I can help start them on the right path. Even the mayor of Chicago must have (belatedly) remembered what he learned as a child. When you do something wrong, you need to apologize. Will peace ever come to Chicago? I’m not sure it can. But here’s something else I can do; I can hope.